How to crochet the virus shawl! Row 1: chain 10, slip stitch to the 1st stitch to form a ring, chain 3 (counts as the 1st dc), 19 dc into the ring. Row 2: chain 3 (counts as the 1st dc),turn, skip the 1st dc, 1dc into the 2nd stitch from hook, 1dc in each stitch across. Row 3: chain 4, turn, skip the 1st stitch, 1dc into the 2nd, *chain 1, 1dc into the next* repeat from* to * across. Row 4: chain 10, turn, skip 1st chain space, 1sc into the 2nd space, *chain 4, skip next chain space, 1sc into the next space* repeat from * to* two more times, (chain 7, skip next space, 1sc into the next space,) repeat from ( to ) one more time, repeat from * to * 3 times, chain7, 1dc on top of turning chain. Row 5: chain 3, turn, 9dc into the 1st space, 1sc into the next space, *chain 4, 1sc into the next space* repeat from *to* one more time, 10 dc in each of next two spaces, 1sc int the next space, repeat from * to * two times, 10 dc into the last space. Row 6: chain 3, turn, 1dc into the 2nd stitch, 1dc in each of next 8 dc, 1sc into the next space, chain 4, 1sc into the next space, 1dc in each of next 20 dc, 1sc into the next space, chain 4, 1sc into the next space, 1dc in each of last 10 dc. repeat this pattern until you have the length you want. 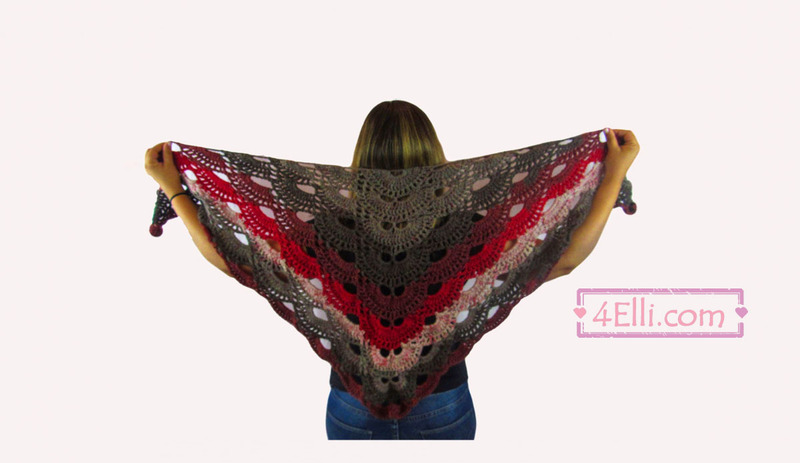 Please watch my video tutorial witch shows you how to crochet the virus shawl step by step! !